Technology can help us get fit, lose weight, manage what we eat, or just distract us while we exercise. 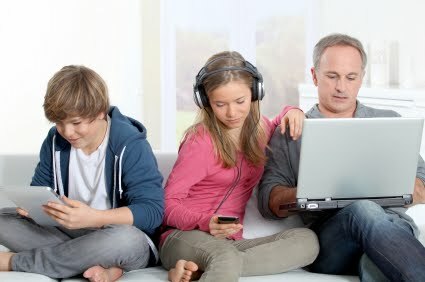 Family Tech from April 11, 2013 is online. Since I wrote the column, some members of the public have been able to purchase Glass. Starting Tuesday, April 16, some who ordered in May of 2012 were able to pick up their Google Glass in Mountain View, California at Google Headquarters. So much more is known now about Glass. A good resource for information about Glass is Google+ Glass Explorer's community. Google published several web sites about Glass Monday night. Google has said Glass will be sold to the public later this year for less than the $1500 the Explores are paying. More specific information is not yet available. The Family Tech for April 4, 2013 hopes to take some of the drama out of your tax efforts next year by discussing ways to digitize this year's documents so you have them at hand next year. Be sure to see the links post further down, for links pertinent to this column. Be sure too to search in either iTunes App Store, or the Android Play Store for terms like "fitness", "diet", "biking", etc. to see other apps. There are others. Search for "Document Scanner" in iTunes.